Look we're not going to beat about the bush. We love a good novelty campaign. All the better, when a novel campaign serves to deliver a worthwhile message. When it comes to UK universities, they really come alive during recruitment and clearing season. We were recently talking to a someone who thought that higher education institutions had a real reputation of playing it safe when it comes to marketing. NATURALLY, we immediately directed them to the TERMINALFOUR blog. We have worked in the higher education space for a LONG time and honestly we're constantly surprised by the creativity of university marketing teams. Over the summer, we will be posting some of our favourite recruitment and clearing campaigns from past years and we will also be keeping an eye on this year's clearing campaigns. So if any of our loyal readers are currently locked in a layer somewhere plotting something spectacular, do let us know! In early 2017, to coincide with the launch of Trainspotting 2, the long-awaited sequel to the 1996 Scottish classic film, Edinburgh Napier University decided to create a recruitment campaign with a difference. They launched the "Brainspotting" a web and social media campaign which aimed to shine a spotlight on five University researchers and lecturers with a view to highlighting the institution's academic reputation. The campaign highlighted areas of research such as literature, cyber-crime, sustainable construction, forestry, and transport. 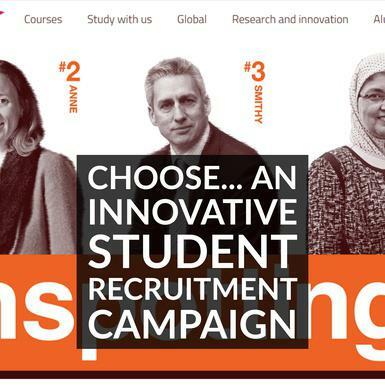 The campaign landing page linked to five staff profiles which showed the outstanding research achievements of the five researchers and lecturers. One of the reasons this campaign works so well is that it's playful. Universities know that it's hard to get prospective students and relevant stakeholders interested in research. This campaign hooks you straight-away. It personalises the researchers and it manages to make their respective fields and achievements interesting. I think the real takeaway lesson from this campaign is that it pays to not take yourself too seriously. It pays to take risks, and the next time someone in your university floats a wacky idea, don't just dismiss them! What's the wackiest campaign your university has ever created? We're dying to know.